Sky Filming has conducted roofing inspections and surveys in Yorkshire and all over the UK on various types and size of buildings, including private houses large and small, churches, listed buildings, factories and even an entire science park with acres of modern roofing. 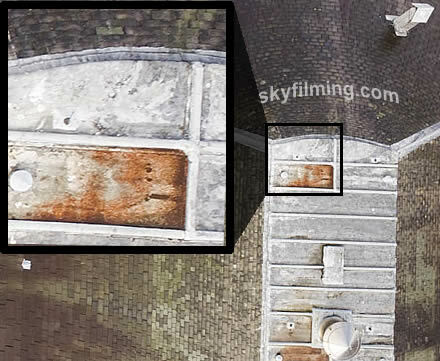 We can examine roofs with full hd or 4k video cameras, or take a series of high megapixel images that cover entire roofing areas, no matter the size, so every detail and aspect of a roof can be surveyed. We are also able to use our aerial photographs to create a 3 dimensional model of specific roof details or building that can be viewed in Adobe Reader as a PDF (as well as other software) and spun around and zoomed in and out to carry out scale surveys off site. For example, you may require a 3D model of a chimney stack to figure out how to rebuild it without actually going up to the roof in the first place. Drone roof inspections and surveys can save a fortune in money and hours, days or even weeks of time in some cases, where vast amounts of scaffold and/or expensive cherry picker and crane hire may have been used in the past just to see what needs fixing and what does not.